That was the year that the first Red Stripe beer was brewed, though the beer itself was unrecognisable from the pale lager everyone knows today. The first Red Strip was an ale, much heavier and darker than today’s Red Stripe. During the next decade, the Red Stripe beer was revamped, improved upon, and eventually became the 4.7% ABV pale lager that we all know today. But the famous Red Stripe stubby bottle would come much later – in 1965 to be precise. That’s right. 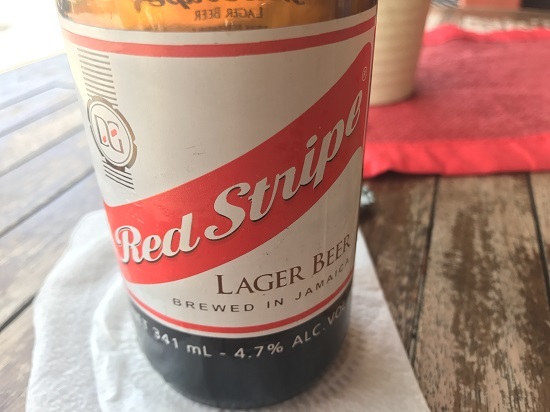 Though Red Stripe has always been made in Jamaica – originally by Desnoes & Geddes at the Surrey Brewery on Pechon Street – the recipe for Red Stripe was first produced in Illinois in the United States of America, before it was eventually sold to the brewery and brought to Jamaica. Not that it really matters where the recipe came from, of course, but I think it’s interesting that it can even be traced back to the US. The marketing geniuses behind the brand initially packaged Red Stripe in green standard 12 U.S. fl oz (355 mL; 12.5 imp fl oz) bottles, aiming to be like Heineken. But it backfired, and even the Americans who had enjoyed drinking the beer on their travels to Jamaica were put off by the fact that it wasn’t packaged in its distinctive brown bottles. Eventually it did become a success, though, and in 2005 Red Stripe beer export volume exceeded domestic volume and consumption for the first time ever. Other Red Stripe sporting sponsorships include the 2007 Cricket World Cup in the West Indies, the Jamaican national football team, and according to Wikipedia, the Air Hockey World Championships way back in 2010. How’s that for a quirky and diverse sponsorship portfolio? You might also enjoy these top 10 facts about Heineken beer.